After our review last week of the ongoing Alley Theatre production of “A Christmas Carol – A Ghost Story of Christmas,” we’d like to show you the other side of the coin. 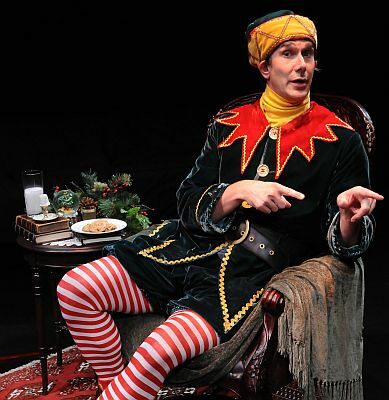 In addition to Dickens’ holiday classic, the Alley is once again presenting a second holiday production, David Sedaris’ “The Santaland Diaries” on the more intimate Neuhaus Stage. This one-man show chronicles the author’s true and sometimes comedically horrifying experience as a worker in Macy’s SantaLand display in New York City. As a 39-year-old struggling actor, the main character seeks out a job as an elf in this world-famous holiday display and is reluctantly exposed to overly-enthusiastic elfin management, parents who care more about the perfect holiday photo than the fact that their child is terrified of the rotund, bearded man in red, and Santas who seem to be incapable of breaking character – even in the Macy’s employee cafeteria. Although David Sedaris first broadcast his essay “Santaland Diaries “ on NPR in 1992, the plot resonates more than ever now in 2011. The Alley’s production references the current recession, joking that most of this year’s elfin workers are the unemployed staff of Lehman Brothers and other failing financial institutions. This isn’t the only script-change that long- time fans of the piece will note; the production also pokes fun at the currently downtrodden Houston Rockets and the hell that is eastern Lubbock. The audience was a well-rounded group of high schoolers, couples on date night and Houston’s most established. All may have been seeking a break from the traditional Holiday fare of cheery yet cheesy that we are all spoon fed during 24-hour marathons of “It’s a Wonderful Life.” Instead, audience members enjoyed hearty helpings of anti-Christmas humor with a whopping a side of sarcasm. The show runs November 30 to December 31, Tues., Wed., Thurs., and Sat at 7:30 pm; Fridays at 6pm and 9 pm; and Saturdays and Sunday Matinees at 2:30 pm, and is approximately 1 hour long with no intermission.